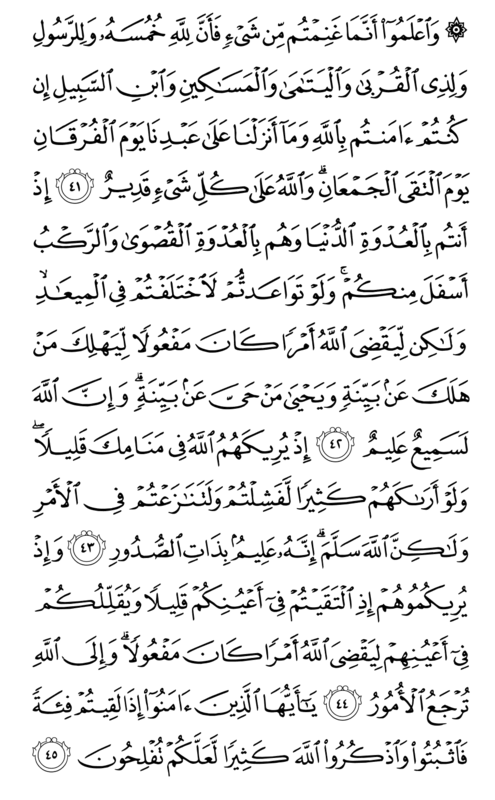 8/Al-Anfal-41: And know that whatever you take as bounty of war, a fifth of it is for Allah and for the Messenger and for his near of kin and the orphans and the needy and the traveler, if you believe in Allah and in that which We sent down to our servant, on the day of Discernment (the Criterion between right and wrong, Furqân), and the day when the two forces met. And Allah has Power over all things. 8/Al-Anfal-42: You were on the near bank of the valley (on the Madîna side) and they were on the farther side (on the Makkah side), and the caravan was in a lower place than you. And if you had an agreement, you would certainly have broken away from the appointment. But that Allah might bring about a matter (order) which was to be done, that those who perished would perish upon evidence and those who lived would live upon evidence. And most surely Allah is All-Hearing, All-Knowing. 8/Al-Anfal-43: Allah showed them to you in your dream as few. And if He had shown them to you as many, you would certainly have become weak-hearted and you would have disputed about the matter. But Allah saved (you). Surely Allah is the All-Knowing of what is in the breasts. 8/Al-Anfal-44: And He showed them to you as few in your eyes, when you met them, and He made you to appear little in their eyes, in order that Allah might bring about an order which was to be done. And to Allah are all affairs (Orders) returned. 8/Al-Anfal-45: O you who believe (who are âmenû)! When you meet a party (an enemy force), then be patient and remember (repeat the Name of) Allah much, that you may have Salvation.